i think i'll call in on friday. first trip into the city in a long time, and it's conveniently next door to frith st! i went yesterday, and was thoroughly confused. 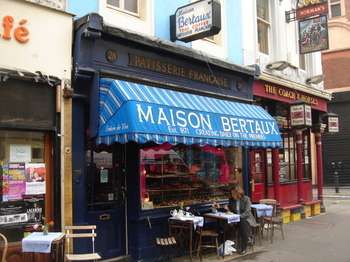 the shop to the right of the cafe that has chairs outside it - are they part of Maison Bertaux? there was a strange, very pimp-esque man loitering at the entrance of his minicab doorway nextdoor, but after you got used to him he added to the environment. i thoroughly recommend this cafe. 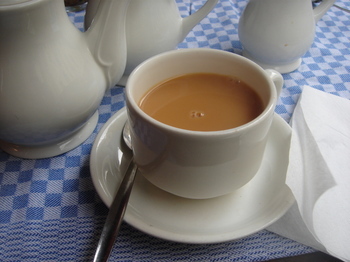 I have just started an MA project on interesting cafes and have visited a couple in your archive. I particularly enjoyed Maison Bertaux because of its quirky decor, scatty but lovely owner and fantastic array of pastries- and I was allowed to take photos! There were some interesting types in there aswell, which made my time there thoroughly enjoyable! Will definitely be going there again. 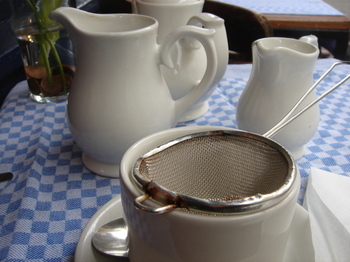 Maison Bertaux, is a great Tea shop / Cafe, after reading Damiens recommendation, how could you not rush for a pot of tea. 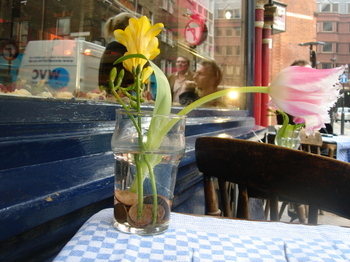 London Living at its best. I have been a Maison Bertaux fan for more than 20 years, partly for the proper tea but also because the pastries are so scrummy. The tables upstairs are too close together, the man in front of the minicab shop next door (he seems to have been there for ages) is a strange addition, but the whole place works. One of my favourites, because of the quirks; my last raspberry tart from MB had 25 raspberries on it, which certainly was a plus as well. Yum.